Blanch the peaches for about 10 seconds. Peel and cut in half. Place wine, vinegar, honey, sugar, vanilla, cinnamon sticks, and lemon juice in a large saucepot. Bring to a simmer and let cook for 5 minutes. Add peaches and cook until heated through, about 6 minutes after returning to a boil. Using a slotted spoon transfer the peaches to a canning jar with vanilla and cinnamon sticks evenly disbursed. 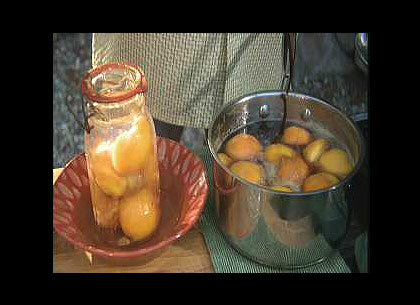 Pour the boiling syrup over the peaches and fill to 1/4 inch below the rim of the jar and seal. Peaches will last in the refrigerator for up to a month. Serve over a roasted chicken, in a salad, or with goat cheese. Reduce cooking time to just 3 minutes after returning to a boil. This segment appears in show #3208.